Dinky is our new pony. He is our youngest Shetland pony at 8 years old. He was born in South Wales and lived in the west country before coming to The Ranch. 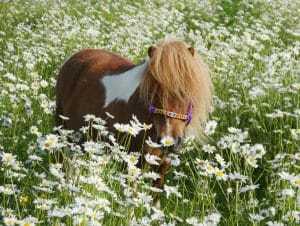 Dinky is also our smallest Shetland pony at only 32 inches. Ponies and horses are measured in hands (the width of a grown-ups hand is about 4 inches). So Dinky is 8 hands high (8hh). He is called Dinky because he is so small. Dinky means attractively small and neat, cute and adorable and our new Shetland pony Dinky is all of those things. Dinky is a very pretty colour, known as skewbald, with a rich chestnut brown and white coat. He has a very pretty head, with an adorable white patch on his nose, which is called a snip. He has a striking light mane and a brown tail. Dinky is well trained and loves children and he enjoys being brushed and ridden. He has made good friends with the other ponies at Shetland Pony Club. It’s time to meet our new Shetland pony called Dinky! He is our smallest pony and super cute. Find out what the other Shetland ponies think of him!